Sonderjourneys » Blog Archive » A Happy Birthday! I chose the verse in the morning, and in the evening this wonderful group of people truly did gather about me! These are my online classmates from Drexel. We had gotten to know one another quite well, but met for the first time at graduation. It was wonderful to march in graduation together and celebrate this milestone together. 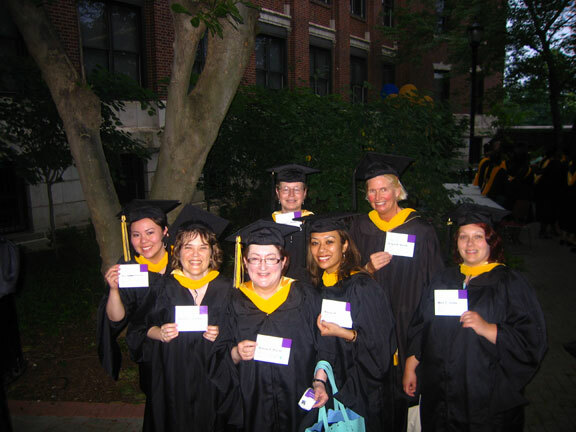 Marching in my MLIS graduation from Drexel indeed felt like a sign and symbol of God’s goodness to me these past few years. Yes, I’m still hoping and praying and standing that my marriage will be restored. But in the meantime, God is pouring out blessings on me. I still find it amazing that I was able to complete my degree and find a wonderful job that required the degree within two months after finishing. God is good, and life is good. And having wonderful people gathered about, rejoicing with me, was a wonderful way to celebrate that. This entry was posted on Tuesday, June 17th, 2008 at 11:24 pm and is filed under Librarians, Photos. You can follow any responses to this entry through the RSS 2.0 feed. You can leave a response, or trackback from your own site. I see nothing bad or evil about you still hoping and praying and standing that your marriage will be restored. How much worse, bad, or evil if you do the opposite?